Cambodia's government has ordered internet service providers to block online access to The Cambodia Daily newspaper. In a letter dated Sept. 28, 2017, recently made public, the Ministry of Posts and Telecommunications ordered internet service providers to block IP addresses to the Cambodia Daily's website. The order extended to the newspaper's Facebook and Twitter sites. However, technology experts say these remain unblocked. The ministry did not return request for comment from Radio Free Asia, or RFA. 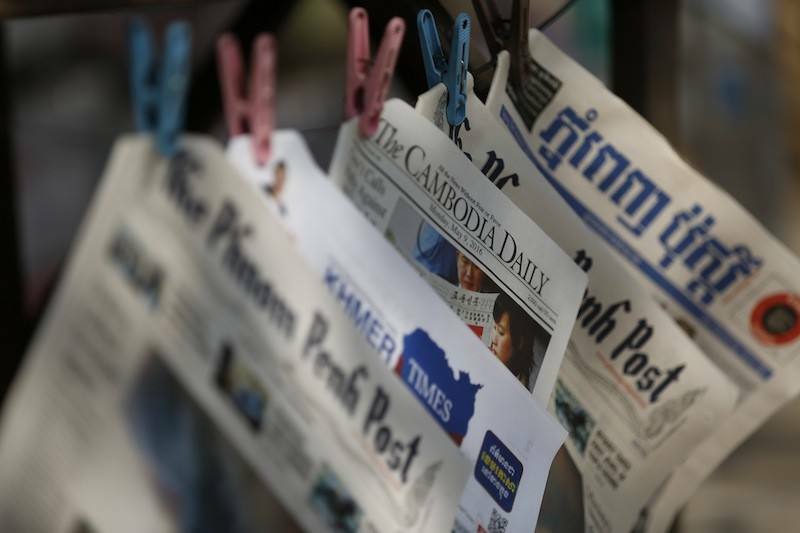 However, internet service providers in Cambodia have confirmed to customers and the Phnom Penh Post that they had blocked access to the newspaper website. They said this block came after the government order. Nop Vy is executive director for the Cambodian Center for Independent Media. He told RFA that the government's actions were damaging to media freedom and open access to information. "Our citizens find it necessary to receive news and information from a wide number of sources," Nop Vy said. He added, "The more they receive news that is independent from government control, the better they will be able to live in our society." The Cambodia Daily was closed last year after failing to pay millions of dollars in what Prime Minister Hun Sen said were back taxes owed to the government. Around the same time, the government also suspended 20 radio stations that carried content by U.S. broadcasters RFA and Voice of America. And it banned the U.S.-funded National Democratic Institute or NDI from the country. The organization supports open government and citizen participation in democracy. On Feb. 5, Australian legislator Mark Butler asked his government to sanction Cambodia for their actions. Australia has a duty, he said, "to the Cambodian people and to our own values of democracy and freedom to oppose the anti-democratic actions in the lead-up to Cambodia's June general elections." Butler added that Australia had played an important role in the Paris Peace Accords. The country promised to protect and provide free and fair elections after the Khmer Rouge. In a response, Cambodia's ruling party spokesman said the call for sanctions reflects the Australian government's own political interests. He said that the government has obeyed the Paris Peace Accords and the rule of law. As for the organizations that had been shut down, he said, "They made their own mistakes, and must be held accountable for their actions." The plan will be signed by the music and film industries, Internet service providers and the government. As for her engagement with Adam, I would say the portents are gloomy. In return, they are themselves accused of furthering their own (leftist) political interests. The current electoral law is still heavily weighted in favour of the ruling party. 5.He told RFA that the government's actions were damaging to media freedom and open access to information. Mr Dennis said he had requested access to a telephone. My ex-wife deliberately sabotages my access to the children. 6.Around the same time, the government also suspended 20 radio stations that carried content by U.S. broadcasters RFA and Voice of America. Around the same time, he also declined a proposal to perform for10 nights at a London arena. This year, Thanksgiving falls around the same time as the Mid-Autumn festival.